This is a small program that will determine what size your Stage Builder blocks need to be to cover a certain area in your stage. If you change the boundaries, the X/Y and width/height values will be adjusted automatically, and vice versa. 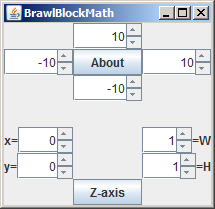 You can click the Z-axis button to show/hide additional number fields for the block depth and Z translation. To the extent possible under law, I have waived all copyright and related or neighboring rights to DisplayLicense.java. This work is published from the United States.